Located just 31 miles southwest of Bend, Quinn Meadows Horse Camp is a favorite among horse enthusiasts. The scenic views, snow capped peaks, high elevation lakes, and scenic rivers are all within reach and are hard to beat. Quinn Meadows also offers easy access to a number of trails, including Quinn Creek Trail, Katsuk Pond Trail, and the Metolius-Windigo Horse Trail. When you aren’t on the trail, you can enjoy fishing and watching an abundance of wildlife, including birds, coyotes, mule deer, and the occasional cougar. The campground is one of the largest horse campgrounds in the area and offers several large equestrian sites equipped with double or quadruple corrals and horse stalls. A manure pit and watering hole are on-site. Horses may be watered only at Sink Creek, and cleaning up manure, hay, and trash is required prior to departure. Other campground amenities include Adirondack picnic shelters, tables, campfire rings, vault toilets, drinking water, and ample room for parking vehicles and trailers at each site. 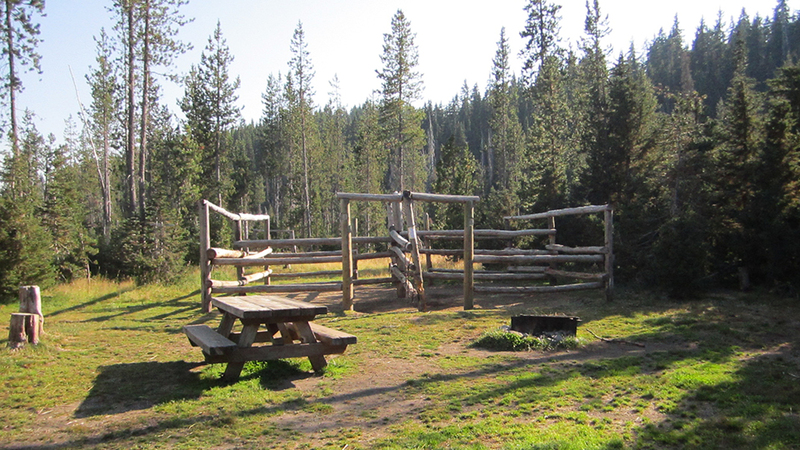 The Quinn Meadows Horse Camp fee is $14-$18 per night and the campground is typically open early June through mid-September. Please note that horse campgrounds have been designed to accommodate campers with horses. With a limited number of these kinds of facilities available in the area, please consider camping in one of the many other campgrounds nearby if you do not have a horse.